As boxing champ Floyd Mayweather prepares to go after his 50th career victory, Topps is getting set to release its first trading card of the undefeated fighter. Mayweather will have his first Topps cards, including an autographed version, in 2017 Topps Allen & Ginter Baseball, which releases on July 19. 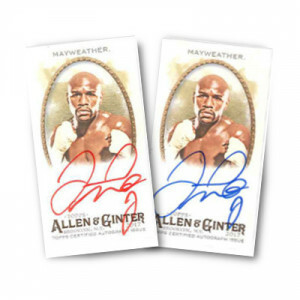 Mayweather’s inclusion in Allen & Ginter fits right in with the 12-year-old brand, which highlights world champions beyond baseball. This will be the first of several products that fans can find Mayweather’s Topps autographed cards this year. Stay tuned for more details. Mayweather recently announced his upcoming fight with UFC champ Conor McGregor on August 26 in Las Vegas. The much-anticipated fight sees Mayweather going for his 50th professional win – and no losses. Fans and collectors can find 2017 Topps Allen & Ginter in hobby shops, Target, Walmart, online retailers and Topps.com on July 19.